If a malicious program that goes by the name of Smartransom Ransomware is up and running on your personal computer, you must take immediate action to remove it once and for all. We advise you to do so because like any other application classified as ransomware it exhibits aggressive functionality. In just a few moments it can lock the majority of files located on the affected hard drive. It goes without saying that this could have disastrous outcomes, especially if the affected machine is used for work related activities. Our research team has conducted an in-depth analysis of this malware, and in this article, we present detailed information about its inner working. Additionally, we provide a couple of virtual security tips that will help you avoid programs such Smartransom Ransomware and so maintain your PC safe and secure. To delete this malware, make use of detailed removal instructions that we provide below. Smartransom Ransomware does a number of things once it gains full access to your operating system. At first, it examines the entirety of the hard drive. After that, it silently starts the encryption procedure. This process does not take long; thus, most users will not be able to catch and stop this malware in action. Since like a lot of its counterparts this malware uses a powerful cipher to lock your files, manual decryption is out of the question. As it turns out this devious program affects file types such as .zip, .psd, .png, .jpg, .docx, .ppt, .doc, .pdf, .xls, and many others. The only fortunate thing is that it does not lock data that is essential for your operating system's overall functionality. 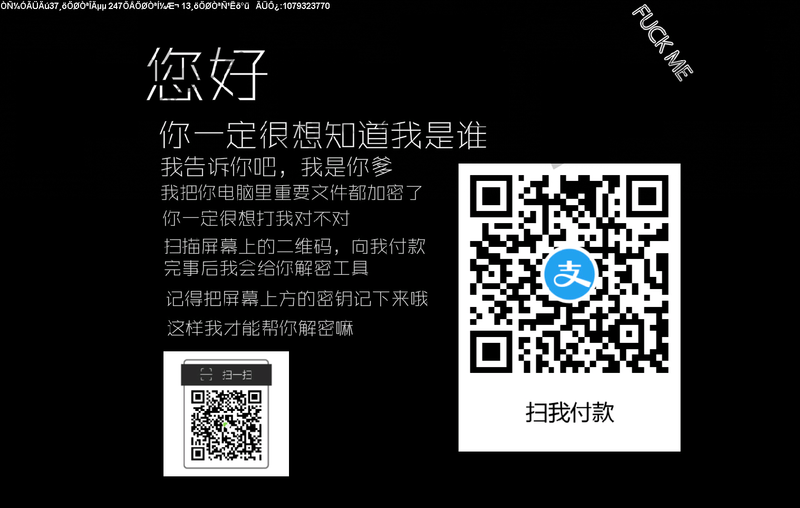 Once all of that is done, the malware in question will present you with a full-screen warning message, which provides information in Chinese and has a QR code. Due to the full-screen message, you will not be able to use your PC the way you like. After translation, it has been found out that the ransom note is rather conventional. It tells you that your data is encrypted and that you need to use a suspicious QR code for further instructions on how you can make the payment in return for decryption services. We firmly recommend refraining from making any payments as it could prove to be a waste of money. That is so because malware developers are not bound legally to unlock your data even if the payment is made. Your best bet to limit the data loss inflicted by Smartransom Ransomware is by executing is complete removal at the very same time that it is found up and running on your personal computer. If you are keen on keeping your computer safe and secure at all times, there are a few steps that you must take to improve your overall virtual security. Even though Smartransom Ransomware is mostly spread within China region, other user must be aware of its existence as well. Since most users infect their computer with malicious software while carelessly surfing the web, it is crucial to practice simple, but effective safe browsing habits. You must know that the primary source of setup files filled with questionable and malicious programs are unauthorized third-party download websites, so naturally, you must avoid them at all times. You will significantly reduce the risk of infecting your computer with devious applications by simply obtaining all of your software from official vendors' websites only. Keep in mind that malware developers frequently use spam e-mail campaigns to distribute their invasive and otherwise malicious programs. Thus, by keeping away from all suspicious e-mail attachments that are sent by unknown sources, you will lower the chance of obtaining a malicious installer. Lastly, but most importantly, be sure to install a professional antimalware tool if you do not have one already. Such a tool is paramount since it provides overall system security at all times. Thus, practicing safe browsing habits alongside a professional antimalware tool will make your operating system virtually unbreakable. To remove Smartransom Ransomware without encountering major problems, make sure to use the instructions that we present below. Remember that you need to delete everything associated with this malware to stop its intrusive functionality altogether. Under no circumstances, rush the manual removal process since a single mistake could lead to an incomplete removal. If this happens, you might have to face devastating outcomes. For example, traces of Smartransom Ransomware could be used to restore it. In other situations, leftovers might be enough for this malware to continue its functionality. To be sure that the termination of Smartransom Ransomware has been successful, you need to scan your computer with a reliable antimalware tool because it can detect and delete anything linked to it in an automated manner. Tap Alt+F4 on your keyboard. Select a malicious .exe file and tap the Delete key on your keyboard. Note that the name of this files is randomized. Quick & tested solution for Smartransom Ransomware removal.